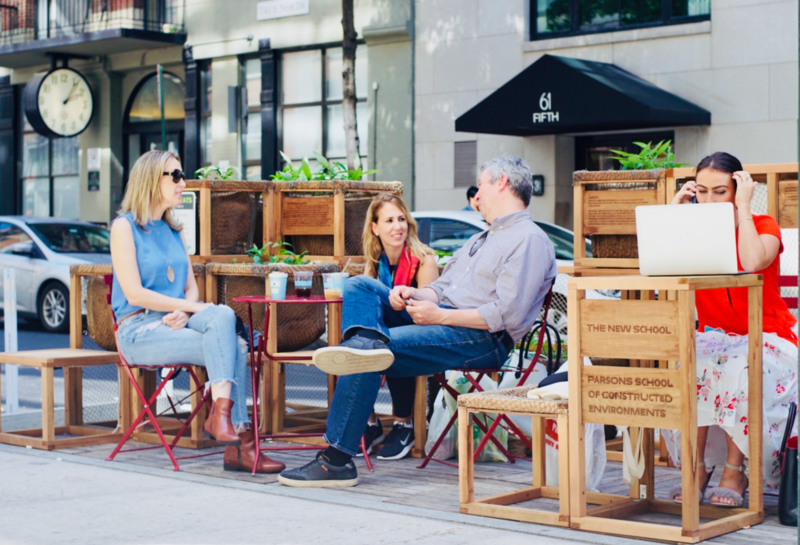 I chose this project as an elective, Street Seats is a seasonal project that reclaims portions of New York City’s streets to make way for fun and useful public space. The mission of the space is to create a design primarily for the the users of the space, site context, materials, and the time constraint of designing and fabricating the installation before the end of the spring semester. This design, emphasizes visual transparency of the space, while protecting the users from the vehicles that travel on 13th street. Square wood framing supports seats, countertops, and planters while allowing the space to feel open and light. Planters are installed on the edges of the seating area to reduce noise from the street and provide a pleasant environment to seat and relax. Herbs and flowering plants were chosen to add fragrance and welcome pollinators. The species selected are also easy to maintain in containers and are drought tolerant. 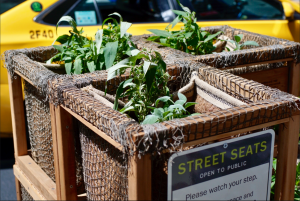 The tree pit that is right next to the site received help from ‘The Greenbelt Native Plant Center’, of the NYC Parks Department. They donated seeds of five native species from their seed bank that were planted to integrate the area with the design. They were used as they have special properties that make them resistant to the wear and tear of typical New York City weather. The main drivers of the design are the users of the space, the site context, materials, and the time constraint of designing and fabricating the installation before the end of the semester.